Namely Maxzilla shaking the tripod, the photos have been taken over the period of an entire day, so when i lost the sunlight, the photos get a little strange in colour, you've been forewarned! Also feel free to click on any of the photos to make them larger! Lets get started shall we?! You will need all your regular sewing supplies that you use for quilting as well as a Dresden ruler, or a template for a Dresden blade. I made my own based on the size that i needed. The idea behind this was to use the lovely stack of AMH Field Study charms that Gina had given me, and i wanted to be able to get two blades from each charm. So my template is 3.5 inches tall, the wide end is 3 inches and the short end is 1.25 inches. So what you need to do is, take a piece of paper and make a rectangle that is 3.5 inches tall and 3 inches wide, On the bottom 3" edge of the template mark 7/8" in from both left and right sides. Draw a line from the top left corner to the left mark on the bottom edge and another line from the top right corner to the right mark on the bottom edge. Cut on these two lines. You now just need to transfer it onto template plastic, a cereal box (preferably one that's been finished) or, like me, just use the cardboard backing from a charm pack! So now that we have our template we're ready to go! Everyone still with me?! Step one, cutting out your blades. Keep your template all the way over to one side when you cut, we want to be able to get two blades from the one five inch charm. I went ahead and used just the template for cutting but you could also place your ruler on top of the template to make it a bit easier to cut. Flip your remaining charm around and cut another! Now you have two lovely little blades. Repeat this until you have thirteen lucky blades! Now, is everyone okay? Should I wait while you fan yourselves? Mind blowing, right?! I’m not really sure what the blogger protocol is when one posts such exciting pictures in quick succession. 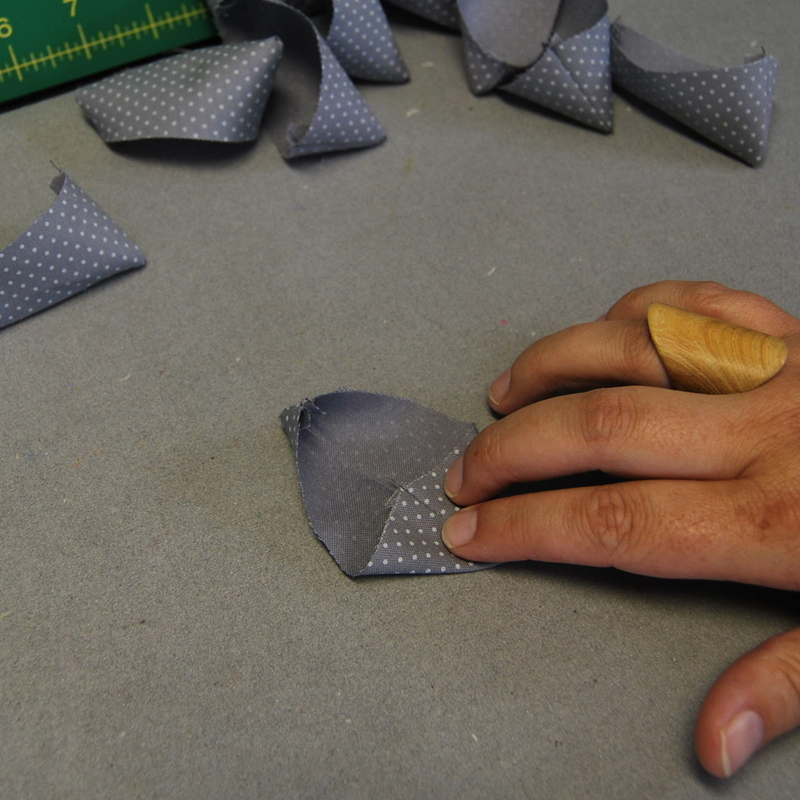 Fold your blades in half lengthwise, right side together and sew the longer side, using a quarter inch seam allowance. I like to chain piece whenever possible. 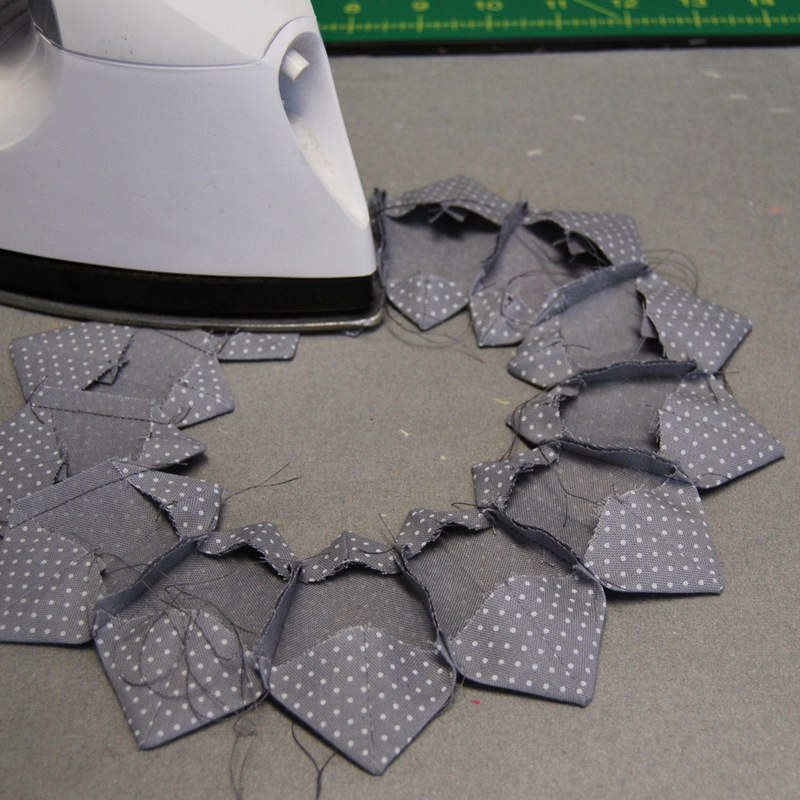 Just remember when chain piecing, leave enough thread in between so when you snip them apart they don't come undone! Now here's where you would stop if you wanted to make a traditional Dresden, let's keep going, shall we?! 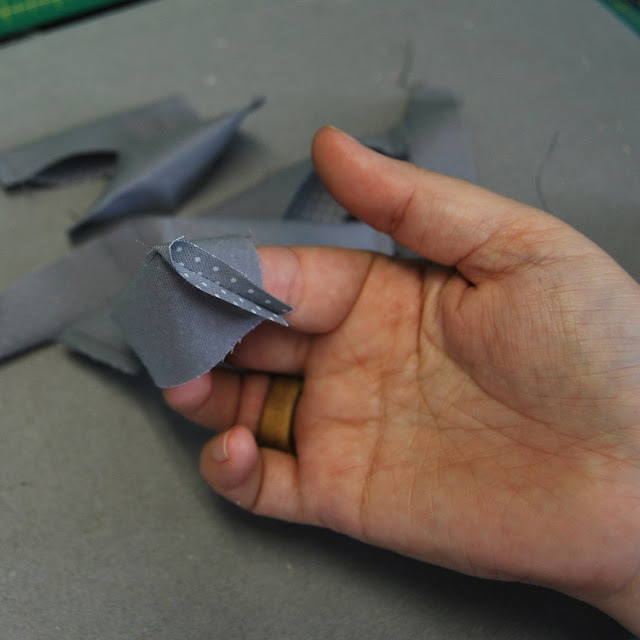 You now want to repeat the same stitching on the short side of your blades. Now you have a whole pile of little canoes! And flip it right side out! You want nice sharp point, i found that the finger pressing really helped get a nice point, as well as making it easier to turn right side out. If you need to though, a blunt pencil or a knitting needle gently pushed in will help get that point! You now have a row boat! Alrightythen, we can all now agree that i desperately need this whole stay at home mom/quilty sewer business to succeed, because folks, there is no way i'm making it as a hand model! She sews all day with secret squirrels. despite the fact this poem's a flop! How wonderful her quilts can be! Now the next step is just personal preference, i like to give my boats a little crease in the middle in preparation for the next step. You can do this by finger pressing or with an iron, whatever you like. If you do choose to do this step, you don't need to press the whole fold, you're really just wanting to mark the center. Now you need to fold over both ends and match the seam with the center. Wash, rinse, repeat... thirteen times! Now take two of them right sides together and stitch down the raw edge. Chain piece in pairs, you'll have one left over. Stitch all your pairs and your one lone blade together so you're left with this. Then take your last two sides and stitch them together! Tadaa! A lovely little star/flower/sun... whatever you like. 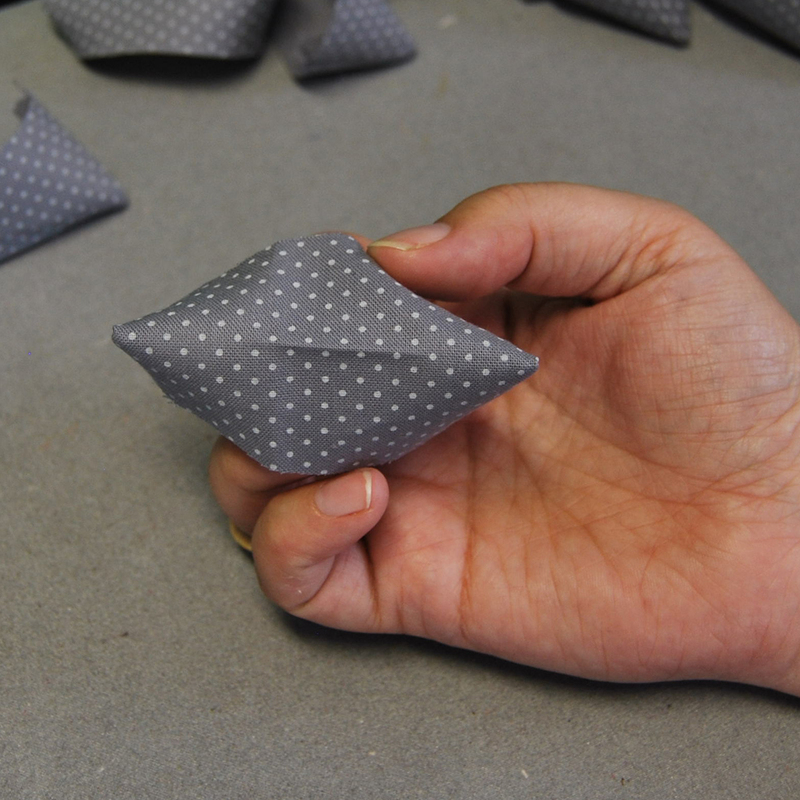 Now flip your star over, and press your seams. I chose to press to the side but if you prefer open, that works too! Then flip it right side up and give it another press. So you'll be relieved to know that we're now done with the prison grey photo's. Really people, what was i thinking?! Boring! I had wanted to do this tutorial with the Field Study prints but by the time i realized i should try a tutorial i had already put them together. With this being the only in progress shot. So pretty! But also i don't have a fabric picked yet to applique this onto. My LQS has some gorgeous wools that i think colour wise would be awesome with the Field Study, i'll have to look into that! We're almost finished folks! And with all the confidence i'm exuding you'd never know that this was my first tutorial! I mean, other than the fact that I keep pointing that out. So our next step is to prep the fabric that you'll be appliqueing your star onto. I chose to use a piece that was 12.5 x 12.5 for a finished block of 12 inches. Or you could decide to fussy cut another print to add into the mix! So if you choose to go this way, here's what you need to do. First find some sort of round object that fits within the points of your star, can't go wrong with vintage Pyrex! Now take your 12.5 inch square and fold in half then in half again. Place your folded square on your cutting mat lined up with the grid. Then place your bowl on the corner with all the folds and line it up so it's centered. 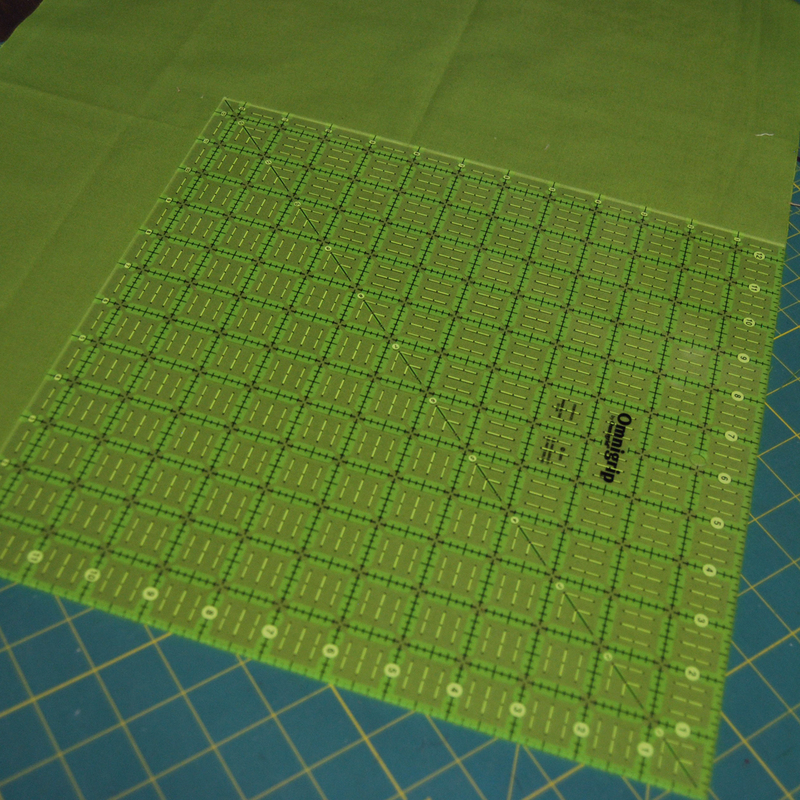 You can kind of see how my bowl is equally spaced on the grid while covering the folded corners of the fabric. Now you need to cut out that little bit of corner, but in order to do that the bowl will need to shift enough for your rotary cutter to get around... or you could mark it with a pen and just use scissors. Again people, it's all about personal preference! And it doesn't need to be exact or even, this will all be covered up in the end! You wont even see the edges! So next you need your piece of fussy cut for the center, I wanted this little grey reindeer with the green hat. You can obviously tell this block is destined for my Christmas Stars quilt! Cut out your center piece sized slightly larger than your circle, side note here... does anyone else do this? Fussy cut a piece out of yardage, then just fold the fabric right back up with a square cut randomly out of it? Or do you re-cut the section so it's even, add to your scrap bin and fold a nice even piece of fabric? Anywho, you now want to applique your fussy cut to your 12.5 inch block. There are so many ways you can do this, this is just how i decided to do it. 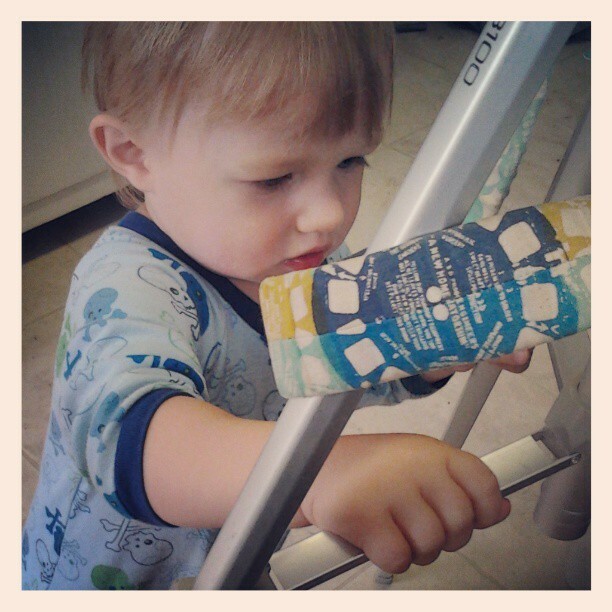 Lay your fussy cut under the hole in your block fabric. Then in lieu of pins i just fold back the corners and use a bit of glue to hold things in place. Then with a zig-zag stitch, zoom around the perimeter of the circle... it is quite obvious by the following photo that i could use some practice in applique! Almost finished! 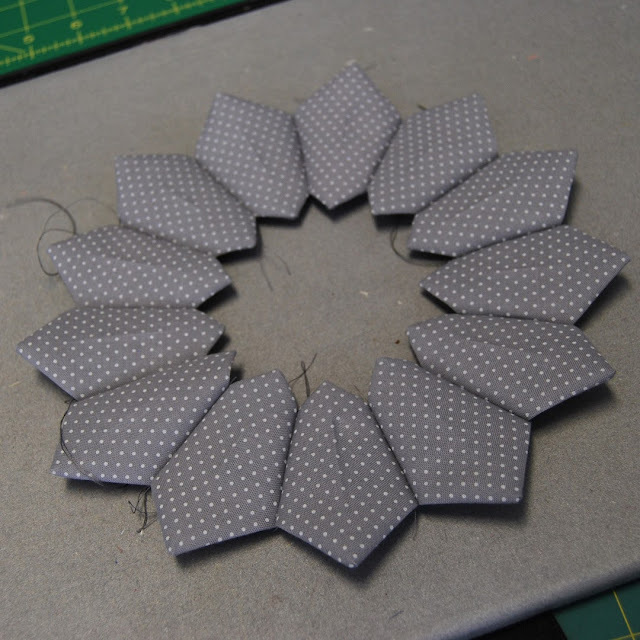 You now want to place your star dresden onto the block where you want it to go and pin it in place. Now just applique around the inside edge in the stitch of your choice. I went with a simple straight stitch and set my needle to the left. After going all the way around you just need to do the outer edge. I flipped my pins to keep the heads out of my way, but you could probably just take them all out at this point. I moved my needle all the way to the right this time and repeated my stitching above, only on the outside of the star dresden. That's it! We're done. Whew, i probably could have broken that down to two tutorials, but hey, at least all the info's in one place right! So here's the finished fussy cut Star Dresden! And here it is with the rest of my Christmas Star blocks! In hindsight, the values between the green and the grey are too close, but i was trying to match the reindeer. Nothing that a bit of hand quilting in pink can't fix... around the outside of the star? Works for me! I really hope that at least one person is still reading at this point, if so congratulations! That was a lot longer than i thought it was going to be! I hope everything was clear, but if anyone has any questions, feel free to ask! And if you do make a Star Dresden, let me know! I would love to see it! As always, feel free to pin for future reference! High fives for my first tutorial! Linking up with Kelly's Needle and Thread Thursday! And over at crazy mom quilts, with Amanda Jean for finish it up Friday! That's a great tutorial! Especially on your first try. Pretty cool, I read the whole thing! Good tutorial to me is the one that seems doable and yours does for sure! Well done. Awesome tute Nicole!! I especially loved the ad for your shop and the vintage Pyrex circle maker. What a beautiful block for your Christmas quilt!! I want one just like it!! Can't wait to see what you end up doing with the Field Study too!! Nicole, this is amazing! I like it so much better than a regular Dresden. And your instructions are super clear. I'm definitely going to make one!! High Fives is right! I don't think it is long at all, and I really feel like I could do this! Rock on! Very nice! It's super cool of you to share your process and I KNOW how much work goes into something like this! what a great tutorial! I love all of the detailed pictures, and it looks so fantastic with all of your star blocks. So darn cute! Trying to figure out to incorporate it into one of my next quilts! Oh I love this! Thanks so much for sharing!! That is fantastic! I can't wait to try it. Thank you. Fun! I never thought of finishing the bottom edge to make a star like that. Cute idea. Like the starry centre, never seen that before. Looking forward to the next tutorial! You crack me up. Congrats on your first tutorial! I love this block, especially the fussy center. I was worried it was going to be all hand pieced...not my favorite. I am going to have to give this block a go soon. Thanks! That makes a really cute block! I hadn't thought of using a different fabric in the center and it's perfect for fussy cutting! Nice job. How did I miss this post? It's awesome! Great job on your tut! And I LOVE the doubled dresden. I think I am going to unstitch the inner 1" on a set of my dresdens that I just did not know what I wanted to do with the middle -- and now I do. Thank you very much. Finally made it over to your tutorial after seeing this in Instagram. 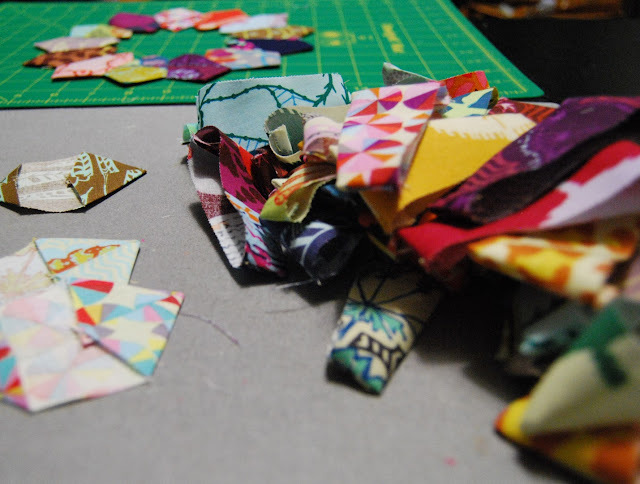 Your tutorial is fantastic & I love the fussy cutting of the center! I've been all about fussy cutting lately. Since I plan to use this block to document quilts I've done & given away I might add that info to the center too.